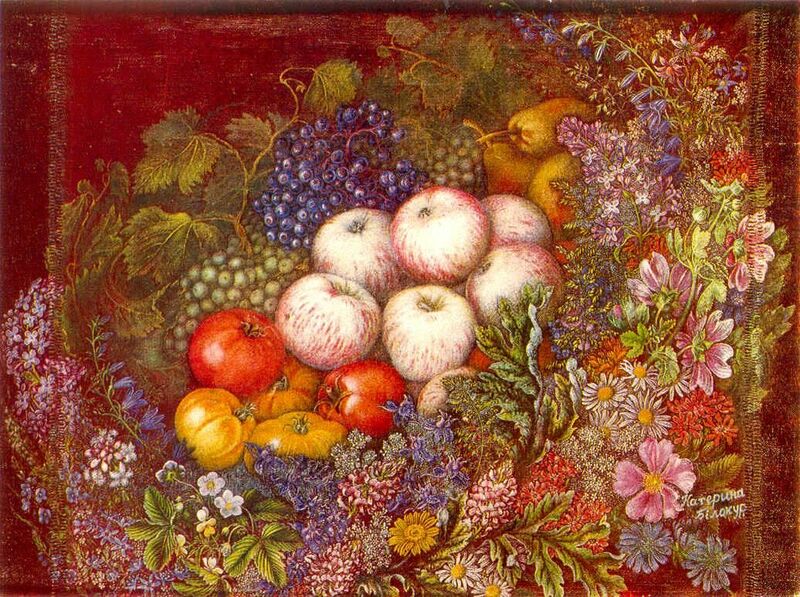 Flowers, Apples, and Tomatoes, Kateryna Bilokur, 1950. It’s last call for local tomatoes here in the New York area, so I decided to give them an elegant sendoff. I had a bag of big, beautiful cherry tomatoes grown by my friend Barbara in her upstate garden. Some were quite soft. A tart, I figured, was the thing, since oven blasting would help them retain their shape and preserve their brilliant crimson color. For a filling I mixed aged Montasio, a firm and slightly sweet cow’s milk cheese from Friuli, with crème fraîche and a hit of allspice. I added a little rosemary to the crust and to the filling. I love the way allspice blends with rosemary. It softens the slight medicinal edge the herb can sometimes give off, lending it warmth while creating a unique woodsy flavor that makes me feel cozy in cooler weather. This gorgeous herb-spice combo is also great in an apple tart. You’ll need a 9-inch tart pan with a removable bottom. To make the crust: Pour the flour into a bowl. Sprinkle on the salt and rosemary, and mix them in. Mix the olive oil with the vermouth, and pour over the flour. Mix well with a wooden spoon. Now turn the dough out onto a work space, and knead it very briefly, just until it forms a ball. (You don’t want to overwork this dough. It should look a little streaky.) Wrap it in plastic, and let it sit, unrefrigerated, for about an hour. Put the halved tomatoes in a bowl. Sprinkle on the rosemary, a little salt, black pepper, and the sugar. Add about a tablespoon of olive oil, and toss the tomatoes so they’re well coated. In a small bowl whisk together the crème fraîche, egg, Montasio, garlic, and allspice, seasoning it all with a little salt and black pepper. The mix should be very smooth and have the consistency of very heavy cream. If it seems too thick, add a drizzle of milk and whisk it in. Place the tart pan on a sheet pan. Roll out the dough, and drape it into the tart pan, trimming any overhang. 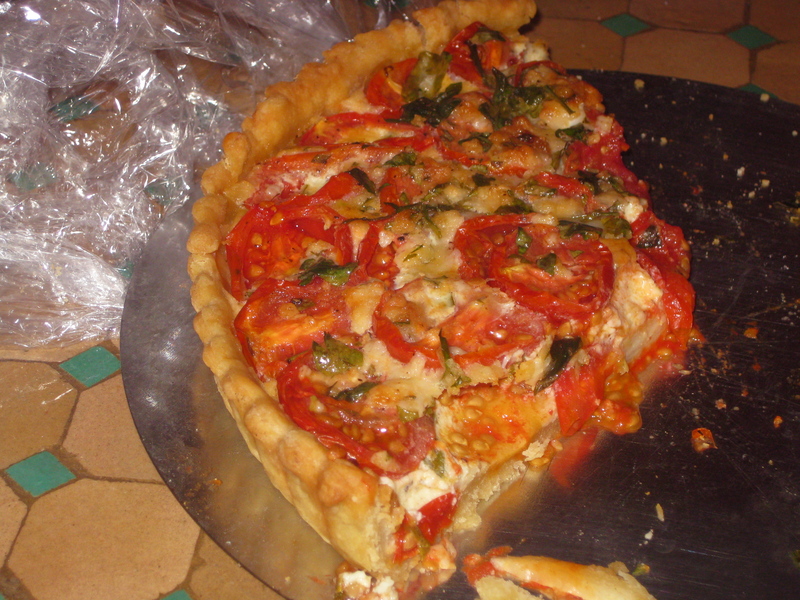 Working in a circular pattern, place the tomatoes, cut side up, in the tart pan, overlapping them a bit. Discard any liquid given off by the tomatoes (or use the liquid in a pasta or stew sauce). Now pour the crème fraîche mixture over the tomatoes, being careful not to drip any outside the dough. Give the top a drizzle of olive oil. Bake until the crust is golden and the tomatoes have a nice roasted look, about 45 minutes. Let cool for about 20 minutes before serving. what a gorgeous dish? Do you mind if I ask: how much does that pizza weigh? Michael, oooh, hard to say. It’s quite shallow, not thick like a quiche, if that helps.